In my researches on World War II Batangas, one obscure little barrio kept popping up in documentation of United States Army movements during the war as well as in accounts of atrocities committed by soldiers of the Japanese Imperial Army in the province. The name of the barrio was Sulac, alternatively spelled Sulak in some World War II literature. A quick check with the National Statistics Authority’s list of barrios1 in Batangas showed that no barrio or barangay in present-day Batangas goes by that name. This seemed to be one of those things that happens often enough in history, i.e. events becoming obscure and subsequently forgotten because names of places were changed. By late January 1945, the United States Army landed its troops on the shores of Nasugbu virtually unopposed. Some of these soldiers would be needed initially for the battle to liberate Manila from Japanese control. By March, however, the US Army was prepared to execute a pincer or two-pronged assault to liberate Batangas. One arm of the pincer swept south from Nasugbu to Lemery and the then-town of Batangas before moving east through Cuenca to Lipa. The other arm went west through Tagaytay, on to Tanauan and Santo Tomas before moving south to close the pincer. In acts of desperation at their impending defeat, the Japanese committed horrifying acts of atrocity throughout the province of Batangas. One of these was the massacre of at least 40 people in a barrio called Sulac2. The bodies were left out in the open and just covered with palm fronds. 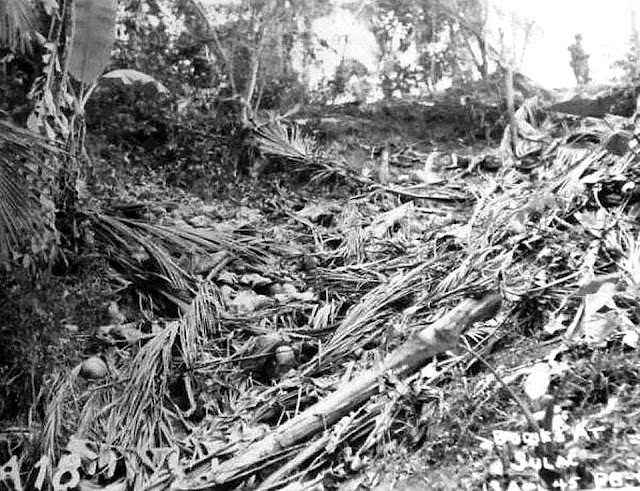 Dead bodies were left in the open and covered with palm fronds. Image sent in by Jigger Gilera, MD. 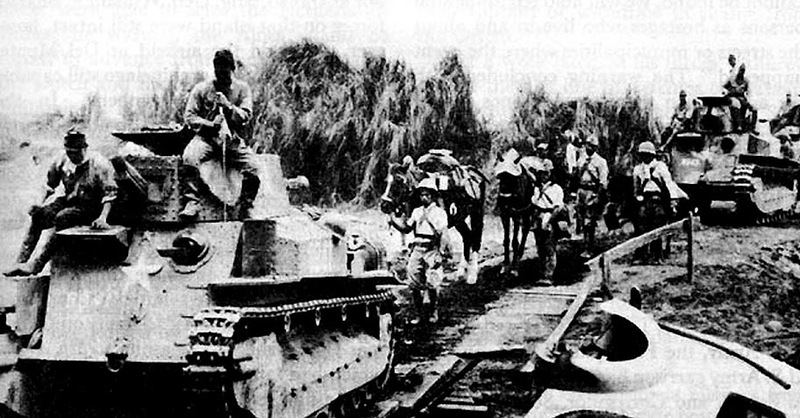 Fierce battles were also fought in Sulac between troops of the 511th Airborne Regiment against the so-called Fuji Force of the Japanese Imperial Army as the Americans sought to drive south into Santo Tomas and Tanauan to complete the northern arm of the pincer. The fighting continued on to the barrios of Sapac and Talisay in the then-town of Lipa3. A US Army listing of dates4 when towns around the Philippines were liberated placed the “seizure” of Sulak (with a “k”) on the 8th of April 1945, “seizure” just one of the operational terms used to describe the taking of territory away from the enemy Japanese forces. But to get to the crux of the matter, what or where exactly was Sulac or Sulak? Many American World War II documents seemed to have thought of the place as a town rather than just a barrio and recorded it separately from the names of other towns in documents about military operations or those killed in action5. In my researches on the barrios of Batangas, it quickly became apparent that the etymology of most barrio names could be traced back to some folkloric story related to a plant in the barrio, features of the land or some cockamamie story involving Spaniards. Of course, there is no present-day barrio or barangay in Batangas named “Sulok,” either. According to the history of Barrio Sulpoc6 in Tanaun City, the place used to be called Sulok. Indeed, the barrio is located at the northwestern corner of Tanauan’s territory. This location, however, rules out Sulpoc because the operations being conducted by the 511th Parachute Infantry Regiment were to the east. But asking around, somebody I know in Lipa, where I am from, recalls having heard elders refer to a Sulok in the boundary between Lipa and Santo Tomas. These same elders seemed to have thought of Sulok, however, as Lipa-side of the border. Greg Badsher’s guide to Japanese atrocities2 does indeed list Sulac as, indeed, having been in Lipa. I also asked two people I know in Santo Tomas, where all the barrios outside of the poblacion or town center are in the present day named after saints, if any of these same barrios used to be called Sulok. The answer quickly came: Santa Cruz. Indeed, the barrio is at the boundary with Lipa; and I was told that to the present day, there are those who still refer to the barrio as Sulok. American planners, it has to be said, rather tended to look at places more for strategic military value rather than whether they were towns or barrios. Hence, there was more documentation of Mt. Macolod (Makulot), where fierce battles were fought, rather than town of Cuenca at its foot. Similarly, Sulac or Sulok as we now know, was strategically important because it was a stepping stone to Mount Malepunyo, to which Japanese troops had withdrawn after abandoning Lipa. At the end of the day, whether Sulok was part of Lipa or Santo Tomas is immaterial. It is possible that the border could have moved since World War II. The important thing is finally establishing that Sulac – or Sulok – was at the border of Santo Tomas and Lipa. 1 “Region IV-A 2015 Philippine Census Results,” online at the Philippine Statistics Authority. 2 “Japanese War Crimes and Related Topics: A Guide to Records at the National Archives,” by Greg Badsher. 3 “History of the 511th Airborne Regiment,” by Leo Kocher, online at The Dropzone Virtual Museum. 4 “List of Towns Liberated by the US Army from 17 October 1944 to 11 August 1945,” created 1945 by the Office of the AC / S for Intelligence, G2, United States Army Philippines-Ryukyus Command. 5 “511th PIR troopers KIA in the Philippines during WWII,” online at Lemuria (Philippines: a Freely Associated State). 6 “Historical and Cultural Data of the Barrio of Sulpoc,” online at the National Library of the Philippines Digital Collections.